There’s nothing like the gift of engraved golf balls to show someone in your life who likes to tee off on weekends that you love them. Frederick Engraving is an online shop for all kinds of sentimental and useful customized goods, and we’ve got your golfing family and friends covered. Monogrammed golf balls are an incredibly popular gift for those who love the sport, as they both help distinguish one person’s equipment from another’s, and give the player the memory of the gifter as they play. We engrave on Callaway Warbird and other high-quality brand-name golf balls, so you know your gift is coming with quality as well as sentiment. We carry engraved golf balls for any typical occasion, and can also produce custom orders to provide you with the personal touch you want. Frederick Engraving was founded in 2012 and has rapidly grown from its origins in a home office to a booming online store because we know how to make personalized goods that are well-crafted and created to last. From our choice of stellar materials to our diverse selection of styles and lettering, you’re guaranteed to find the perfect gift for any occasion that might benefit from an individual and nuanced touch. Our selection of golf balls lend themselves to countless occasions and celebrations. They can be passed out as favors at a party, with the celebration’s name and date. We have sets for Father’s Day, birthdays, and for use as wedding favors honoring the father or parent of the bride or groom. 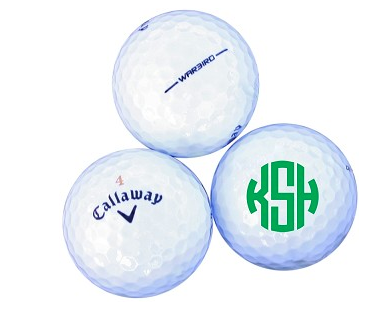 Of course, we also sell the popular traditionally monogrammed golf balls, in a single large letter, double initials, or triple initials. All our engraving and printing can be done in a wide variety of fonts and colors to suit the personal taste of your loved one. Golfers value the ability to be able to distinguish which ball is theirs after a long drive into the green, and with engraved golf balls you can give them that gift. Buy online from Frederick Engraving to honor the hobbies and the individuality of your family athlete. Shop Engraved Golf Balls Now !